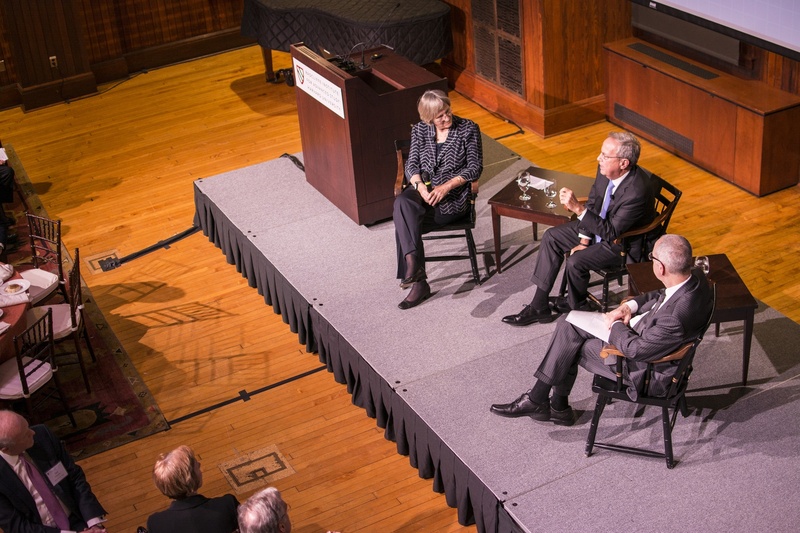 University President Drew G. Faust leads a discussion on the future of university education with Richard C. Levin and David J. Skorton, the former presidents of Yale and Cornell, respectively. UPDATED: October 26, 2015, at 4:38 a.m.
Before a room filled with representatives from universities around the world, University President Drew G. Faust kicked off a conference about the future of research in higher education, highlighting the need to accommodate the current university landscape to the technological developments of the 21st century. In the panel Thursday night, Faust spoke with Richard C. Levin, a former Yale president and current head of online education company Coursera, and David J. Skorton, a former Cornell president and recently-appointed secretary of the Smithsonian Institution. The three university leaders shared their perspectives on a range of issues, from constructing new campuses abroad to online education. “The result here is all of you today, to help us think and to help all of you think about the new kinds of challenges that we encounter as we try to imagine physical campuses in a digital age,” Faust said in her opening remarks. The officials from Harvard and elsewhere convened at the Radcliffe Institute for Advanced Study for a two-day program of events and conversations. The group enjoyed salmon, steak, and panna cotta between remarks from Faust and a panel discussion. Levin, who led Yale for 20 years, recounted the decisions he made to grow a number of the school’s programs, specifically in the sciences and abroad. He cited several challenges of innovating in the design and construction process, saying universities need to think about projecting 30 to 50 years ahead and that that effort requires a central authority. Multiple times, Levin questioned the utility of faculty committees, arguing they can be ineffective because they are subjected to the opinions of faculty members who may not think in the long-term. Instead, he said he tended to ask each committee member their individual opinions, rather than accept the vote of the group, strongly preferring “single unitary leadership” from the president. “A great pitfall in universities is we delegate too much to committees,” Levin said. As trends in education continue to move towards science, technology, engineering, and math, Skorton reminded the audience of elite educators that arts and humanities studies should not be forgotten. Citing Faust as a model humanities advocate, Skorton claimed that arts and humanities education is important for helping students develop analytical and critical thinking skills. After the former presidents made opening presentations, they discussed their experiences with Faust and opened the floor to questions. From the audience, Michael D. Smith, dean of Harvard's Faculty of Arts and Sciences, asked about the benefits of having satellite campuses around the world—institutions that both Yale and Cornell have established, but that Harvard has chosen not to construct. The evening’s proceedings drew a large crowd and were also recorded on video. “I’m struck at how often that I find myself at gatherings where the question of whether online learning is going to take over the world is posed, when people have come from all over the place in order to be here face-to-face,” Faust said. An earlier version of this article misattributed a quotation from David Skorton to Richard Levin. In fact, Skorton “found it if not impossible, very hard, to have a senior vision” while overseeing Cornell's campuses. Michael I. Levin '42, has been appointed to the Freshman Smoker Committee, George A. Kuhn, chairman, announced yesterday.